My source lies in China (in the province of Yunnan), from where I flow for 1,200 kilometres. Named the Red River due to the colour of the silt I transport, I cross Vietnam until reaching Hanoi before delivering my water into the Gulf of Tonkin. My two sisters, the Black (Da) and Clear (Lo) Rivers, which also spring from Yunnan, follow me closely over a large part of my course. My watershed straddles 26 provinces and is the home of 30 million people, 20 million of whom live in my delta. Despite my highly irregular discharge, which can vary from 450 m3 to 30,000 m3, I have always been a choice route for transport, and an essential resource for the region’s highly dynamic agriculture. Most of the plain (80%) is devoted to the latter, with rice and maize being the predominant crops. Unfortunately, I’m also known for the violence of my discharges which cause very frequent floods. My hydroelectric potential is subject to increasing exploitation, making it necessary to set up an integrated management body capable of responding to the needs of the population while preserving my ecosystem. Everything began in the 5th century. Then, human beings attempted to tame me and build dikes. It was a means for them to control my floods and supply themselves with water for their daily use and irrigate their crops. I had to wait until the second half of the 20th century to see new structures built along my course, especially with diversions to protect Hanoi in the case of overflows. In the 1970s, real dams were built to control my floods and manage irrigation. Faced by the increase in demographic growth, in the 1990s the government started a huge programme of reforms, recommended by international bodies, that included managing my waters. It has to be said that the urbanisation of the time took little account of the most basic rules of precaution, since the houses were built between the dike and myself, that’s to say on land very vulnerable to flooding, which happened often! More recently, Vietnam wanted to exploit my hydroelectric potential by launching the construction of a large number of hydropower plants. Dikes, ramparts against floods, pumping stations, etc. the purpose of most of the developments involving me is to improve irrigation. My delta is considered to be the birthplace of Vietnamese culture. It is where the country’s traditional economic activity is concentrated. the spring cycle, from February to June. A third cycle has been developed on still more fertile land comprising market gardening, maize and mulberry trees (needed for silk worm breeding), in addition to cattle and pigs. My natural hydrographic network has been modified to optimise crop yields. A natural and artificial network of branches and canals has been deployed. For example, the plain has been divided into 30 irrigation and drainage zones that form artificial watersheds. Since the earliest times, I have been an essential transport corridor for goods and people, reflected by the constant development of navigation infrastructures. Of Vietnam’s 33 river ports, the four main ones are managed by the Vietnam Inland Waterways Administration (VIWA). 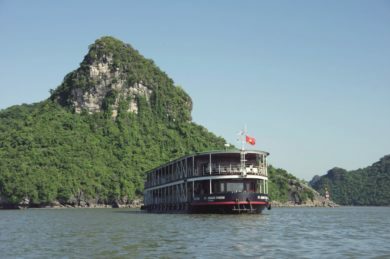 This agency is a branch of the Ministry of Transport and is responsible for managing and maintaining Vietnam’s ports, navigable rivers, canals and lakes. Thus, it is an important institution for the country. 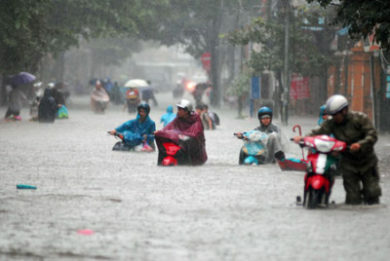 Hydropower schemes have been built, especially in the province of Phu Tho, sixty kilometres from Hanoi. Other projects are being studied for the near future. In 1975, a diversion canal was excavated to protect the capital against floods. However, it did not prevent the floods occurring downstream of the city, towards the flood plain of the River Day. Nearly 500,000 inhabitants living on this land are directly concerned. 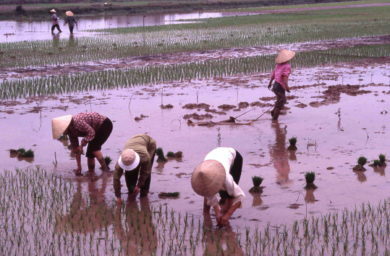 Up to recently, the studies involving me had mainly focused on irrigation, but given the urgency of recurrent overflows, research projects were launched at the beginning of 2000 to improve the ecosystem and control floods. Not before time! To meet the constantly increasing demand for electricity (on average 10% a year), Vietnam plans to raise its production capacity by from 3 to 6 GW/year, with the goal of reaching a total capacity of 80 GW a year by 2020, by developing both nuclear power and renewable energies including hydroelectricity, a vital resource. Energy is a key sector that receives public aid for development provided by France and French companies, such as CNR, offer their competences in engineering to assist the country’s energy transition (REN and river transport). China and Vietnam have not yet established genuine cooperation to take care of me and there is a lack of consultation between the different actors and territories in Vietnam. However, discussions would be useful to tackle the current challenges of pollution, climate change and sharing resources between up and downstream. 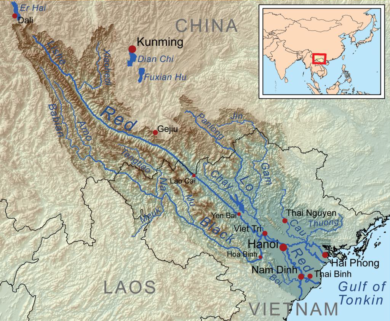 The construction of hydropower dams upstream – on the Chinese side of the border – negatively affects the Vietnamese section of the Red River while growing urbanisation modifies the flow of rainwater runoff and increases the risk of flooding. Water is everywhere in the Red River delta but poorly distributed. promoting compliance with international standards relating to the treatment of the project’s environmental and social impacts. It was commissioned in 2015. Hello, I invite you to visit the following page, on the Initiatives for the Future of Great Rivers (IFGR) website :Red River https://www.initiativesrivers.org/rivers/red-river/ Best regards.